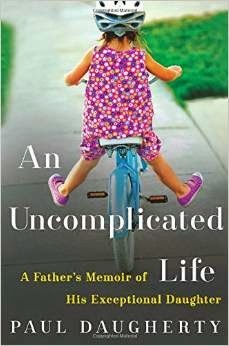 I accepted An Uncomplicated Life : A Father's Memoir of His Exceptional Daughter for review because I love titles which show the beauty of a life given. This book tells the story of Paul and Kerry Daugherty's daughter, Jillian, who was born with Down Syndrome. It is a book described by others as being "an inspiring love letter" from father to daughter. It is a very sweet and touching story. It will come as no surprise around here that I liked the concept of this book because it supports the argument that all life is valuable. Modern society is very obsessed with each of us looking a certain way and being able to all do certain things. We cringe at handicaps of any sort and wish them away with laws that would deny humans the right to live before they have ever been born. My position is that life begins from the moment of conception and that all life ought to be protected. This is my opinion. As clear as I am on that point, let me be as clear on Daugherty opinion: he is not writing his daughter's story with an agenda over the concept of what makes a life. To be more specific, while he is incredibly glad that he and Kerry have had Jillian in their lives and he wouldn't trade his daughter for the world, he also does not mean to place blame or criticism on "the moral choices" of others. Towards the end of the book he raises obvious questions about what the world might look like if we chose to wipe out an entire race of people who are different than ourselves and these are certainly questions worth pondering. I think Daugherty and I would form different answers to the question but I still enjoyed reading his thought processes. An Uncomplicated Life takes us from the point in time shortly before Jillian's birth all the way through her graduation in college and life with her current boyfriend/fiancee (at the time of this post). Reading this story gives you a nice, big overview of the life which Jillian has lived to date. When Jillian was born, Paul and Kerry decided that they weren't going to focus on the limitations placed upon their daughter but, instead, they would look for the possibilities. Choosing the positive approach over a negative one certainly served Jillian well. Daugherty relates the way he and his wife (literally) fought with school administrators over the entire course of Jillian's educational career to allow her to be included in regular classes, have her homework modified, and receive special assistance while not being excluded, etc. He explains in some detail the frustrations of trying to keep Jillian in with her peers and educated at the same time. Their deep desire for their daughter was that she would learn how to hold her own socially, and be the most educated person that she could possibly be. Again, most of the book talks about their struggles with school administration. If I were to list the main reason Daugherty wrote this book, I would say that he is writing Jillian's story to fight for the right of those with Down Syndrome to be treated equally. That is most certainly a worthy and important goal. Secondly, I would say that he wants the world to know that his Jillian is a masterpiece in and of herself. She is beautiful, fun, loving, enthusiastic and kind. He wants us to know that people with Down Syndrome have much to offer to society. I agree. An Uncomplicated Life really is an inspiration to read. It's nice to hear of the Daugherty's passion to integrate Jillian into society. It's delightful to read about her cheery personality who, quite simply, loves her life. I'm so glad that Jillians exist in this world. People with Down Sydrome certainly do have unique qualities to share with us all. They give us perspective and we need that. I'm glad to have read this book for more of such a thing. I do have some quibbles with it as well, although most of which are so minor as to not be worth mentioning. There is one that I will mention because it tickled my funny bone and caused me to burst out laughing. Oh dear, dear me, Mr. Daugherty. We poor uneducated home schoolers who can't even crack eggs. Heavens to Betsy! Sometimes I think it's a miracle that I survived to adulthood. It may have come to me late in life but eventually I did learn to crack an egg and now I crack them with abandon. Sometimes I'm like a crazy egg-cracking machine. And now I can be all, like, "Oh yeah, I was home schooled....watch me crack this egg." Booyah! Astoundingly I even learned how to read! I am a wonder to behold. It really gets my goat in an amusing sort of way when non-home schoolers question home schoolers. Can we be an insane breed perhaps? Anti-social? A bit dippy? Perhaps just . . . different? And if the argument that we're all making is that we need to embrace each others differences then shouldn't be back peddle on the whole "home schoolers are questionable people" spiel? A little give, a little take? I don't think home schooling is for everyone, but by golly I think it's super funny that you would make a negative-sounding comment because some kid had never cracked an egg before. (But I suppose if that's the worst you can come up with then you have to work with it.) I have actually known real people who purchase those frozen peanut butter and jelly sandwiches and pack them into their kids public school lunch boxes. No egg cracking involved. Serious. Anyway, this is just one little instance where the book tickled my funny bone in a rather sarcastic way. I certainly don't agree on a great many of Daugherty's moral stances or personal preferences but that in no way detracted from my ability to enjoy his book. He has a positive message to share about and for individuals with Down Syndrome and it's good to read. All egg-cracking jokes aside. Many thanks to William Morrow Publishing who sent a copy of this book in order to facilitate this review. I received no additional compensation for this post and you can entirely bet on the fact that 100% of the opinions expressed above are my very own. This is a theme that I see in any book dealing with someone with Down's or a severe handicap or disability: that every life is valuable and has worth. It's incredibly sad that people want to snuff our the lives of those who might be born with such. Sounds like a good book to read in our current "get rid of anything that's not perfect according to my standards" society.